Ok, I said I wasn’t going to be posting regularly for a while but these industry-specific posts just kept coming and coming. How could I not share them? 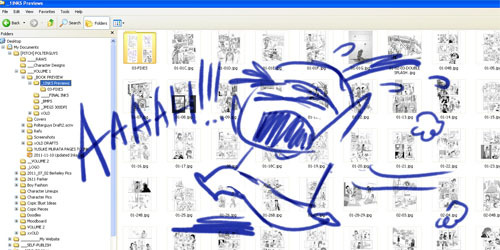 The clock is ticking down to publication day (Ghost Day is June 29, 2012 which is the first day of Anime Expo) and new developments are forcing my hand so I’ve modified my schedule with the hope I can get the book in my hands by AX. 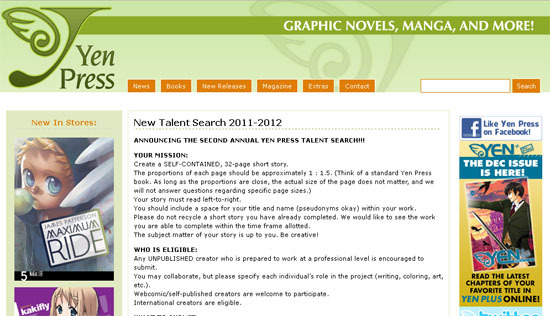 With the Second Annual Yen Press Talent Search officially on it’s way and excitement, hope and the promise of victory sloshing around the burgeoning manga artist community, it’s worth remembering a few things to clarify the intentions of the good folks at Yen Press and avoid misconceptions. It’s been a roller coaster year for me emotionally. Early on, I had high hopes to join the manga industry following a “win” at Yen Press but that has instead led me to pursue starting my own business, a most fortunate turn of events I think. Not only did learning about the ins & outs of publication and comic distribution expanded my understanding of the industry, I can also say that I’m better prepared to take care of my own interests when it comes to making deals with bigger publishers. I’m very grateful for the opportunities and fortunate events that have come my way last year and hopeful that better things have yet to come this year!